2. The search that took place followed a statement provided by the presumed Salvadorian terrorist arrested in Venezuela, Francisco Chavez Abarca, in which he involved Peña Esclusa in a supposed plot against the state. Due process was not respected; first because Chavez Abarca’s statement was not before a court, as required by law, but at SEBIN’s headquarters; second, because the Salvadorian was immediately extradited after to Cuba, without trial, in spite of being involved in a plot to destabilize the state, according to the government itself. It is presumed that he was extradited, so that his testimony was not distorted in a trial or that the facts may not be investigated in depth. 3. The search in Peña Esclusa’s home also failed due process; first, because Peña Esclusa was detained and handcuffed without being charged; secondly, because the Director of Intelligence of SEBIN, David Colmenares, publicly accused him by name before the television cameras, without legal charges being levied; third, because he was not allowed assistance by a lawyer, who at the time was at Peña Esclusa’s the door, in spite of the fact that it is explicitly indicate in the Codigo Organico Procesal Penal (COPP) or Criminal Procedure Code; and fourth, because the officers simultaneously searched all the areas of apartment, without the presence of its tenants, which allowed the planting of illegal evidence, inside the desk drawer of the smallest child of Peña Esclusa, an 8 year old girl, where later the officers “found” C4 explosives along with detonators. Officers exploited this search to steal cash, jewels, electronic equipments and other valuables. 4. The previous day to the search, the weekly newspaper La Razon published an article warning that SEBIN would search Peña Esclusa’s home. Additionally, Peña Esclusa himself had taped a video and a phone conversation two days before, forewarning that the government would try to illegally implicate him in the case of Chavez Abarca. If Peña Esclusa would have had explosives hidden in his home, and been publicly forewarned of the search, wouldn’t he had taken them someplace else, ahead of time? 5. The court ordered a trial while in reclusion, in spite of the plenty reasons established by the COPP for the right for a trial while on bail. In Venezuela, judges who decide against the executive power’s will risk being immediately fired; and, in some cases jailed, as with the judge Maria Afiuni, presently incarcerated because of liberating a political prisoner. 7. 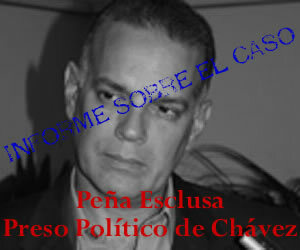 Peña Esclusa has been systematically persecuted by Chavez’ government. He was illegally jailed in 2002, also at SEBIN as ordered by Chavez. The government media and officers have carried out a smear campaign against him. Chavez himself has publicly attacked him on radio and television. For over two years he has been denied permission to travel outside the country. Has been followed by the police, received threats against his physical wellbeing and constantly harassed. Charges of governmental persecution against Peña Esclusa, were introduced by his lawyer at the International Criminal Court (The Hague). 8. Alejandro Peña Esclusa (56), has no criminal record, has no training in handling weapons. Has been an outstanding athlete, earning international prizes for his country. He has a stable and a well-respected family. He is a mechanical engineer, with higher courses in financial administration. He was adviser to the Consejo Nacional de Seguridad y Defensa de Venezuela (CONASEDE) or National Security Council and Defense of Venezuela. He is a writer and columnist, author of six books, some of which have been translated into other languages. He was candidate to the presidency of Venezuela. He is a Venezuelan and Colombian correspondent to the newspaper La Nueva Provincia. Member of the Brazilian Academy of Philosophy. President of the civil association Fuerza Solidaria. President of Union de Organizaciones Democraticas de America (UnoAmerica). Has been conferred the medal Orden José Cecilio del Valle, of Honduras. Granted a special recognition from the Congress of Alabama, for his extensive efforts in defending democracy and civil liberties in Latin America. He has been invited to lecture in almost all the capitals of America. For more information regarding his case, we include below some links in spanish.